Christmas has come early this year (or late - depending on how you look at it). My husband and I started a tradition a couple years ago that involved naming our Christmas tree. We got the idea from dear friends of ours...and since we name everything else in our lives (I drive a car named Betty White) we knew that we could keep this tradition alive. For the past 7 months, I've had a chunk of "Belinda" hanging around my craft room waiting to be transformed into something neat. I had a few ideas in mind, but settled on an ornament - it seemed like a pretty easy project to start with considering I had never crafted with a Christmas tree before. I started by asking my husband to kindly cut me a few discs. I knew I wanted more than one (in case I messed up and had to start over). Next, I warmed up my wood burner. I had gotten it at Michael's (with a 50% off coupon) when I was planning our wedding. 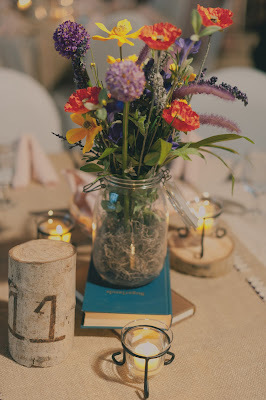 I used it to make table numbers and other little decorations. It works great and is nice to have on hand for random projects (such as this). Then I free handed a little "love bird" design onto my best disc. 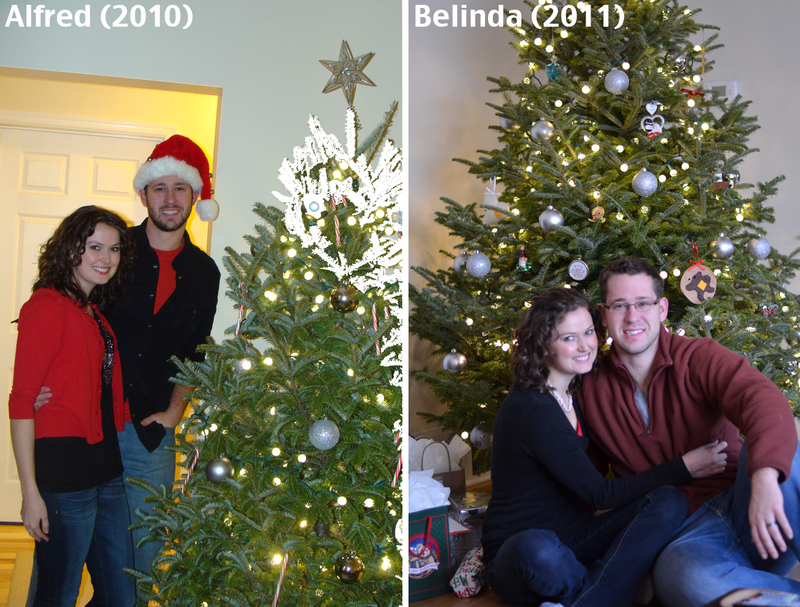 I thought this would be cute to symbolize the Christmas tree from the year we got married. I was nervous to start, so I practiced a few techniques on some scrap wood to figure out the best way to go about burning my design. After practicing for a few minutes, I started on my actual piece. Before I knew it, I was done! I added a little eyelet hook and some twine to finish off my new ornament. I used to save chunks of our trees too but I never knew what to do with them. This is the cutest! And the fact that you name your trees is so fun! Sweeeet! Love it. Hugs! P.S. my new giveaway started, stop by and get your entry in! How cute is that??? I love this idea! What a sweet memory-love this idea! Thank you! 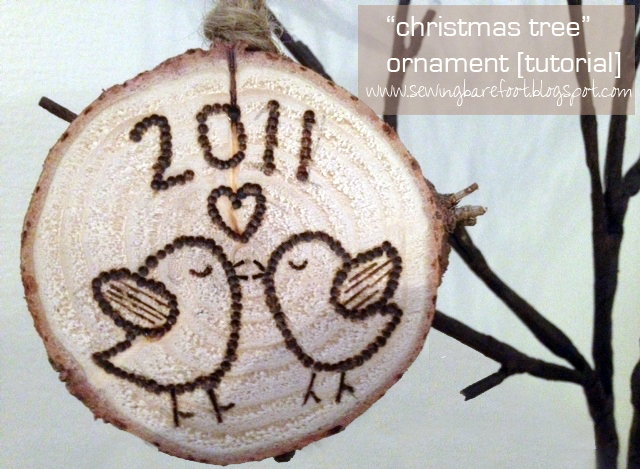 A wood burner is definitely worth the investment :) this project is fun because your options are endless and you can pick a fun memory from the year for your ornament. I already have ideas for this years tree. Is it Christmas yet? :) Thanks for the comments. LOVE this! I think I need a wood burner now. =) Also, I think I may be your new stalker. Haha. Loving your blog! Thanks Angie! There are so many possibilities for a wood burner - in case you needed an excuse to go buy one :) I can't wait to get my hands on our Christmas tree this year. I'm glad you like my blog! And I love this too! A branch fell from one of our trees out front and I wanted to do something with it rather than just throw it away. I love this. I am going to have my husband cut it up for me this weekend! found your blog through the thirty handmade days link up... keep up the great work! 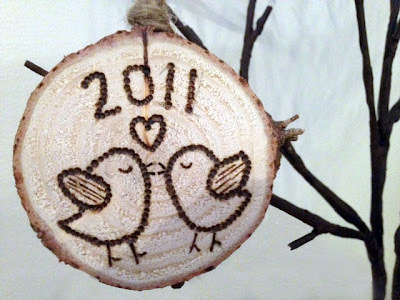 This is adorable, I love the birds and the meaning behind your design. My hubby and I got married in 2011 also! You have definitely inspired me to make one of my own!